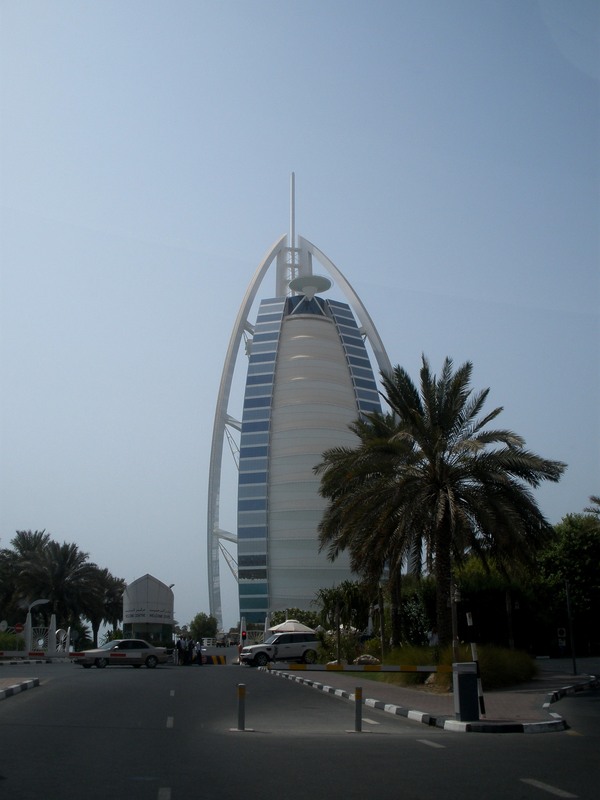 …the only way you can actually gain entrance to Burj Al Arab in Dubai is to be a hotel guest, or have a printed document confirming your restaurant reservation. 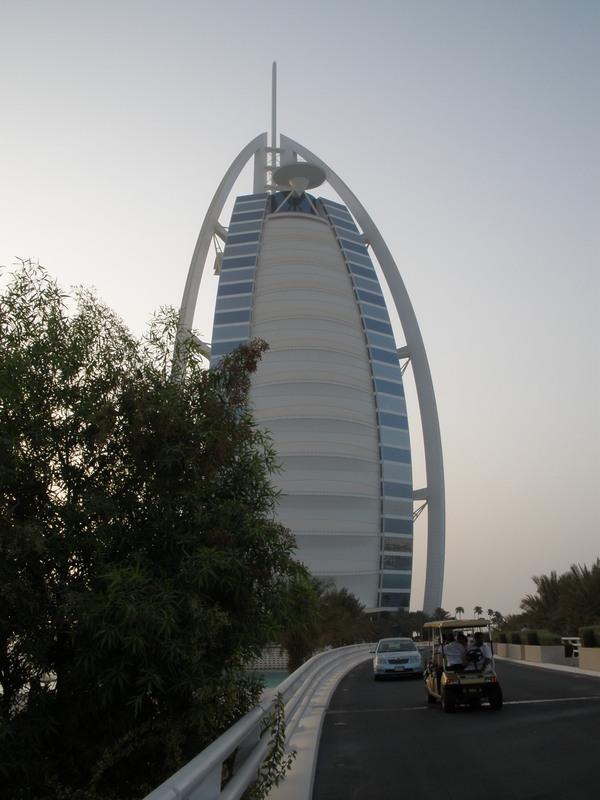 Non-guests wanting to view the interior of Burj Al Arab can only do so from the other side of the barriers at the start of the driveway. 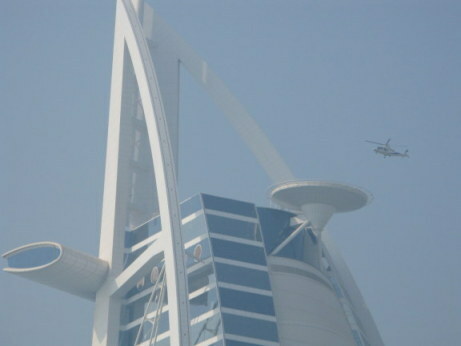 The helipad of Burj Al Arab was made famous in the sporting world by the iconic images of Tiger Woods using it as a driving range before the Desert Classic in 2004, and of Roger Federer and Andre Agassi’s friendly game. We didn't have to wait at the barriers. 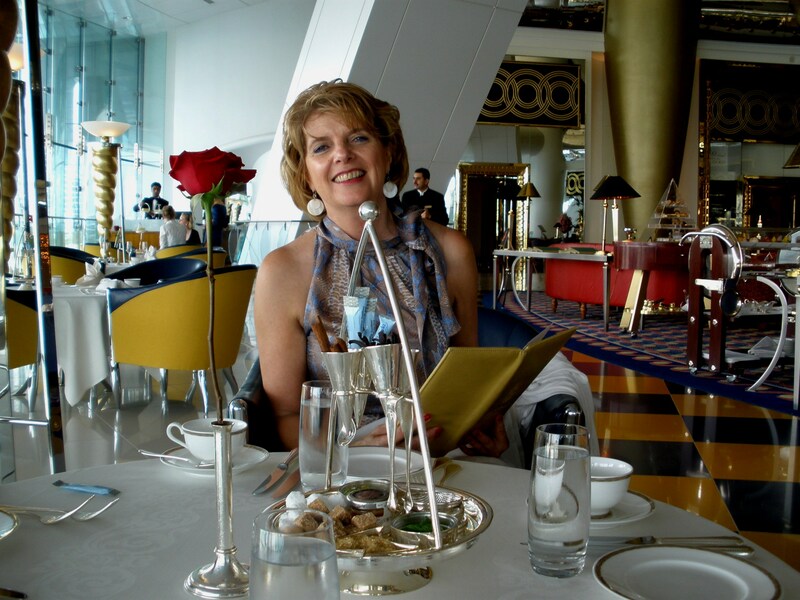 We had a reservation - for Afternoon Tea at the Burj Al Arab Sahn Eddar –the atrium Bar. 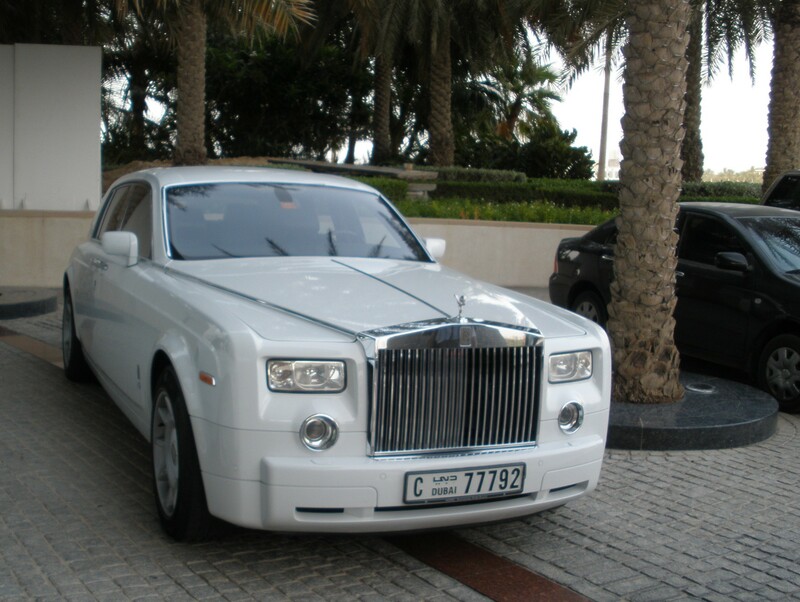 I had been working in Abu Dhabi and Doha over an 18 month period and on our last trip we decided to save up our Dinars and treat ourselves to something extravagant. In coming up with the design, the commission to architect Tom Wright was to develop an iconic symbol that would be immediately recognisable as Dubai. There is some controversy in that the concept was actually only developed by Wright from unsigned drawings from an earlier abridged contract in Dubai by the architect Carlos A. Ott. Nonetheless, the architects had many engineering challenges ahead of them in the construction, and achieved well-earned fame for the results. Designed to reflect the wind-filled sail of a dhow (the traditional one or two-masted sailing vessel with a distictive 'lateen' - or triangular - sail), the Burj Al Arab was built on a purpose built small island of interlocked blocks that protect against erosion. It took 3 years to build the island base with its honeycomb of protection – but less than that to afterwards build the hotel which sits upon it. To hold the building in place without bedrock into which to secure the foundations, pipes 230 forty metres long (almost 755') were embedded into the sand. The friction of mud and sand creates stability. The effect of a billowing sail is created by a section of the building resting between two spans of the V-supporting structure. It isn't glass. 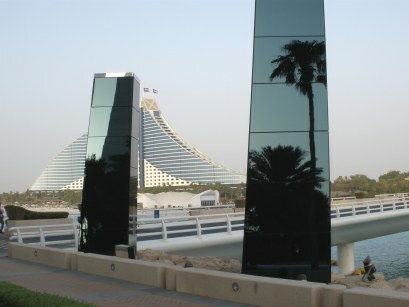 Instead there are two 7,500 square metre (8970 square yards) layered fibre-glass membranes, installed vertically. The surface is coated with a high-performance Teflon called Dyneon. The German company that makes it, sells it under the brand of 3M. Because this membrane doesn’t allow any dust particles to settle on the surface, it minimizes maintenance. This is critical for such a structure in the desert fringe area of Dubai. It keeps gleaming whiteness on the outside and at the same time filters the outside intensely glaring light to a milky quality inside. An interesting problem in enclosing the interior was that of avoiding creating a cloud of condensation within. The solution was to cool the building during construction by incrementally reducing the inside temperature by half degrees each month with cold air nozzles that point down the 1 metre wide gap between the membranes. This gradually filled it with a cool air buffer against the extreme temperatures outside. 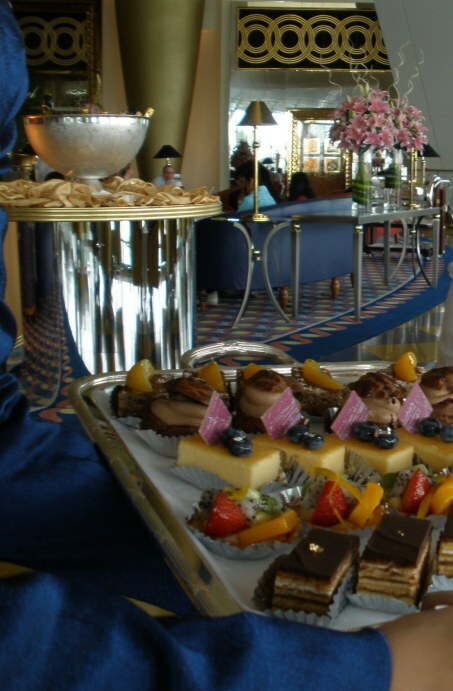 If it's the only way you can manage to see it, take afternoon-tea at Burj Al Arab. Unless of course you have the wealth to accommodate the guest rates where there are 24/7 private butlers, private beach and one of the top restaurants in the world. In 2018 a quick revue of the cost of an overnight stay in a one beroom suite with two people could have been as low as $2207.72 (£1,721.04) - but that DOES include taxes! 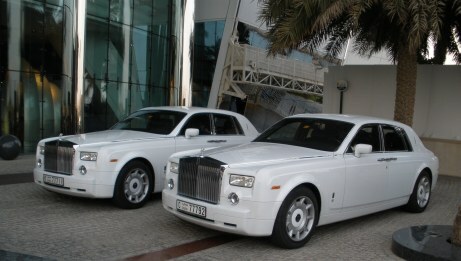 In 2015, as part of the 15th anniversary celebrations of Burj al Arab, the hotel upgraded its Rolls Royce fleet with Rolls Royce Phantom Series II vehicles - 10 of them. When we were there, guests had to slum it with these earlier versions. 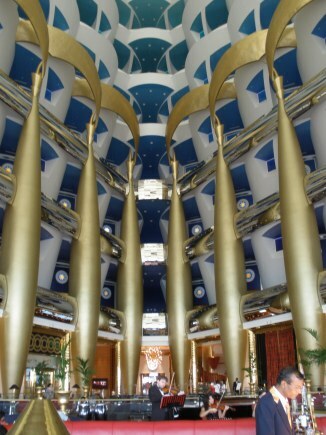 Elegant from the outside and architecturally brilliant; inside, the Burj Al Arab appears to be a festival of excess. Oddly, after a while it starts to be appealing. It “grows on you”. However, many still think the ambiance to be what a friend of mine used to call “Nouveau Gauche” (as distinct from the more traditional term: “Nouveau Riche”). Actually, it is quite spectacular – as you can see. Each floor is the equivalent height of two floors of a regular hotel building, rising to an apex at a height equal to that of a 60 story building. It is the highest atrium in the world - 180 metres (just over 590'). 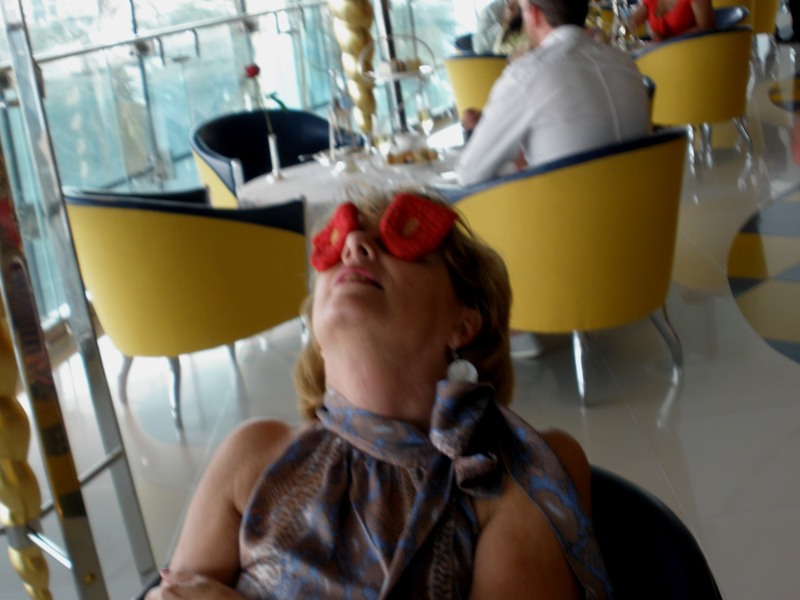 The afternoon tea at Burj Al Arab requires 'Smart Casual' attire. Most guests had made an effort to be somewhat smarter, befitting a hotel that bestowed seven stars upon itself. We were suitably dressed, and as we took in the surroundings, tried not to imitate these fish as they opened and shut their mouths at the guests. 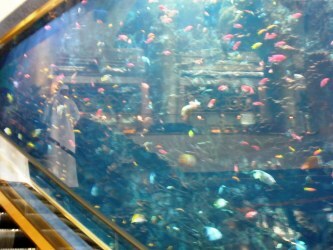 There are three aquariums inside Burj Al Arab. Beside the escalator, these two are designed to be enjoyed by lobby visitors, while at the same time providing a screen of ever-changing colour for diners on the other side. The fish are all natives of the Persian Gulf - over 50 species being represented here. In the Gulf, the abundant sea life is showing signs of severe stress from industrial development, oil spillages, and increasingly high water temperatures and salinity. One dreads to think that there is a risk that without careful marine protection, aquariums could become the sole habitat of these colourful fish. '…surface water temperature … ranged from 20.6°C in winter to 35°C in summer, while salinity levels averaged between 400/00 and 450/00'. Good for a tourist who likes to swim in the sea at the temperature of a warm bath – but not for marine life. 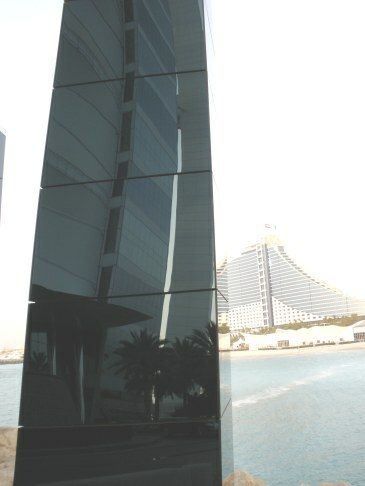 In the bottom right of the picture above you can see the arched entrance to the Al Mahara Restaurant, which houses the largest of the aquariums. Here, the diner can be entertained (?) by sharks swimming in more than 1m litres (262,000 gallons) of filtered Gulf water. 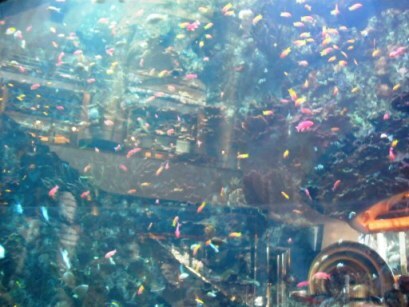 The thought of a shark watching me dine - even though he is behind 18cm (7”) thick-cast acrylic - is not my cup of tea, so we took the escalators past the smaller tanks to take our cups of tea in more serene surroundings. Here in the Sahn Eddar, musicians filled the atrium with classical music- a beautiful environment for the celebrated Afternoon Tea. 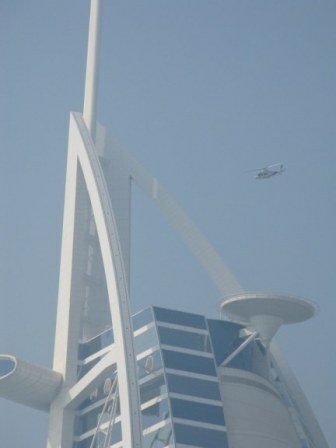 Silver plate holders started arriving, some in the shape of the billowing sail of Burj Al Arab. The exquisite china plates held various trimmings for the perfect cup of tea: others were laden with bite-sized sandwiches. These were soon to be followed by a selection of cakes. It is possible to opt for coffee instead of tea. 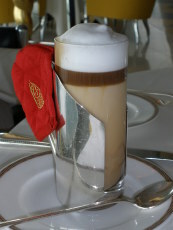 The silver handles of the coffee glass holder have small, red, padded covers so that you don’t burn your fingers. We found other uses for them – ranging from an imitation Red-Nose-Day-nose to eye patches – behaviour we found very entertaining but that was probably quite beneath the expectations of the service staff. but his that enjoys it. 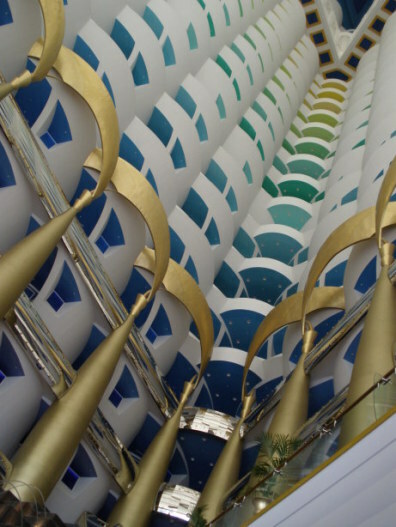 Burj al Arab brings the colours of the desrt inside. We were surrounded by 8,000 square metres (9,568 square yards) of 22-carat gold leaf used in decorations of the building. 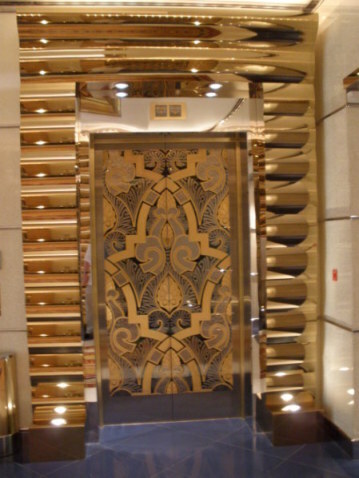 Each of the elevator doors of the 18 elevators shared in the distribution of all this gold - with spectacular visual effect. 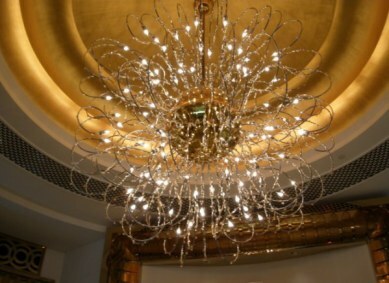 The golden chandeliers with pin-spot crystals refelect the gold in the ceiling alcove. I guess it shouldn't have been surprised when atop one of the cakes, a chocolate wrapped in edible silver arrived at the table. I'm sure the food served for arternoon tea at Burj al Arab didn't need the biocidal effects of silver and this was just to signify opulence. Silver has long been the great protector of the aristocracy. It is a natural biocide that kills off toxicity: hence the saying: 'Born with a silver spoon in his mouth'. Between courses we had mouth-watering sorbet. 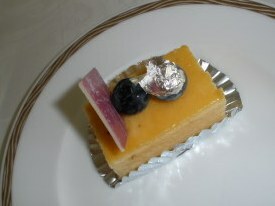 It was finished with the tiniest taste topping of perfectly ripe fruit. 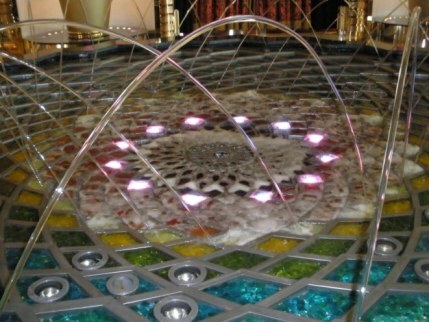 What can be one of the great luxuries of the desert but the sound of cascading water? 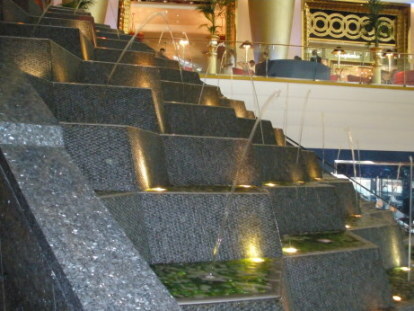 As we left our afternoon tea and exploration of the building of Burj al Arab, we paused to watch the Cascade Waterfall and to listen to the syncopated plopping sound of the water. The water here is finely atomised and blended with fibre optics, resulting in a sort of kaleodoscopic effect. Glass steps are filled with washed stones. Water flows over them, while columns like irridescent flexitubes bounce from step to step in time with music. This makes patterns not just of water, but of sound: quite captivating and peaceful. By contrast, the dancing water of the central fountain surprises you with bursts that reach up to 42 metres (almost 138'). 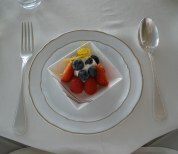 After the afternoon-tea at Burj Al Arab there are more things to delight. The guest panoramas are fantastic. Across the water is the Jumeirah Beach Hotel. It is built like a wave in a sort of flattened “s” shape – designed by W.S. 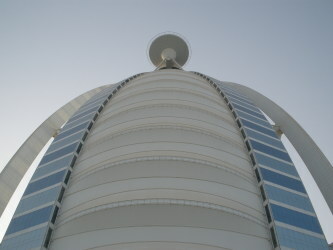 Atkins and Partners, the same architectural firm that created the Burj Al Arab. In front, you can see the Iftar tent for Ramadan. 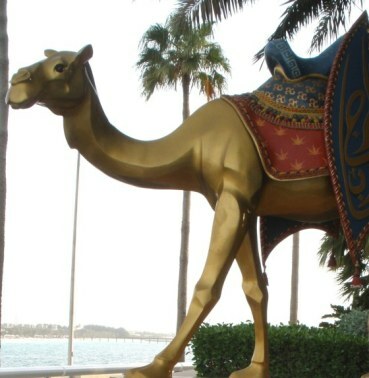 It sits on the shoreline before the 19 more traditionally Arabian-styled beach villas of Beit Al Bahar. The enormous electrical plant required for the air conditioning of this elegant building sits nearly half a kilometre away, so as not to impede the fluidity of design with operational necessities. 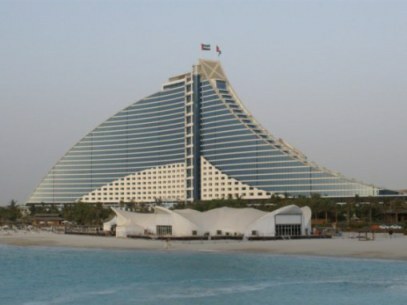 Beside Jumeirah Beach Hotel sits Wild Wadi Water World, the third of the Jumeirah Group’s properties in Dubai. Apart from adrenalin-pumping rides and several machines creating waves on which to practice your surfing, apparently there’s a lot more serene water-based activity to enjoy there. These include a water, sound, and light show with flash flood of 60,000 litres (15,850 US gallons, or 13,198 Imperial gallons) creating an hourly waterfall. All this quite remarkable in a region of tropical desert. Burj Al Arab and its distinctive Dubai landmark partner properties seem to reflect the region's aspirations for the future. The Emirates are aware that their current excessive wealth is based upon the finite resources of oil and natural gas – and that another economic base needs to be established before this is depleted. Tourism is just one avenue to do this. 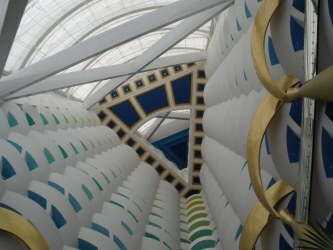 Burj Al Arab is an experience rather than a place. so that you really understand it. but it hovers just an inch above reality.